BoxOffice® — Number Crunch: Pixar Perfect? Too often here on Number Crunch, we cover films that are the victims of the dark side of Hollywood ambition. Translation: we've uncovered a lot of financial flops even among the industry's so-called reliable stars. But there is at least one creative team with an immaculate box office record: Pixar. Sure, last year's Cars 2 was a complete dud (the first, in fact) as far as critics were concerned. But Cars 2 still turned a profit before home video—no small feat these days. Sure, many speculated that Pixar's motive for Cars 2 wasn't quality but merchandising riches, but its also undeniable that kids—especially young boys—adore the series. This summer, however, the girls get revenge (and depending on who you ask, the better movie). 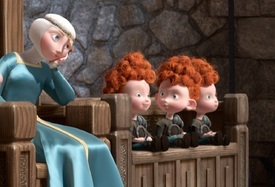 Brave made its debut over the weekend to $66.3 million and gave Pixar a perfect 13-for-13 track record of #1 debuts. With positive word of mouth, Brave is likely on track for a $230+ million domestic gross based on the studio's track record. That's solid, but for Pixar, solid is standard. Every one of their films has hit $200 million except Cars 2, A Bug's Life, and Toy Story—although, accounting for inflation, the latter two films would adjust to $270 million and $347 million, respectively. That's even before considering a 3D bump for either 'toon. Worldwide, Brave should comfortably pass $550 million and turn it into yet another profitable film for the studio. But Pixar has a problem. Compare the performances of Pixar's early films to their more recent endeavors and a negative trend is clear. Pixar's first six films (from 1995's Toy Story through 2004's The Incredibles) grossed an average of $539 million at the global box office with an average cost of $132.5 million each. Their next six films (from 2006's Cars through 2011's Cars 2) saw that average gross increase by 23% to $660.5 million—not bad if that was the only change—but at the same time, the average budget has skyrocketed 82% to $240.8 million. And that doesn't include Brave, which is estimated to cost $255 million after prints and advertising. Simply put, Pixar is spending much more and earning little in return. And the hit is even worse than it sounds—even their recent addition of 3D doesn't balance out the fact that their audience is buying fewer and fewer tickets. And the law of diminishing returns has been setting in for some time. While 2006's Cars generated fruitful retail sales, at the time it was also the least profitable theatrical run by a Pixar film, grossing 2.43 times its total budget. Since then, its sad title has been claimed by WALL-E and then Cars 2 itself, and Brave may be the next Pixar loser to wear the crown. In defense of Pixar, audiences—especially money-crunched families—have increasingly embraced Netflix, On-Demand, and Redbox to save money. But with Pixar's two most recent movies also representing two of the three poorest-reviewed in their history, their decreasing gross-to-budget ratios are a significant red flag. Excluding 2010's Toy Story 3, all six of their films released prior to 2006 were more profitable than every film since. Finding Nemo, Toy Story, and The Incredibles (in descending order of profitability) make up their three biggest hits. Brave is on track to claim a more successful run than Cars 2 itself, but it will still end up far behind Pixar's past successes both in terms of profitability and actual ticket sales. And the trend can be at least partially attributed to good-but-not-great word-of-mouth. There once was a day when it was unfathomable for a Pixar movie to inspire anything less than stellar buzz. Speaking of 2006, that was the year that Disney bought Pixar. Could Pixar's financial fumbles be a byproduct of Disney's involvement (or "interference", depending on who you ask)? It's natural for bigger budgets to come into play after a string of blockbusters, but someone at the studio needs to ask if their 82% budget inflation is very unnatural indeed. As the revolving doors of talent at the studio's offices continue to bring in new creative blood, those new to the team should look back and learn from the standards of quality over commercially-driven motives. Otherwise, we'll soon be referring to Pixar's "Golden Age" in the past tense. For now though, Pixar's incredible streak of successes is still alive, even if the rewards are smaller. It's up to them—not just Disney—to maintain it. http://www.powerfulsport.com	This piece of writing explains the more common misconception that sport from Powerlifting can be described as Power sport exploiting fact will be complete perpendicular. It can be described as strength pursuit. This piece of writing will discuss the difference from the two designs and explain how at the same time are terrific tools for learning not solely powerlifting and yet all athletic.